A rite of Spring at Linderhof is the Cleaning of the Porch. 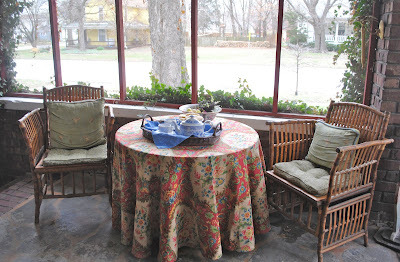 (Our front porch, which a former owner screened). Every piece of furniture is taken off the porch and the whole porch is scrubbed from ceiling to floor, the railings and then the screens are washed with the hose. 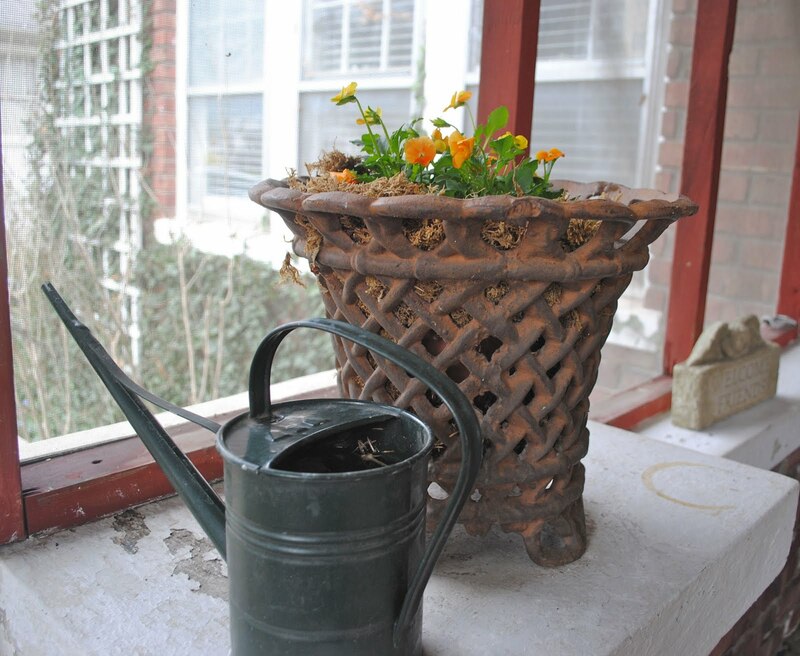 It's a rite of Spring for from fall through the winter, the porch gets very very dirty!!!! Fall leaves seem to have gotten into the corners, Christmas evergreens are found in the corners as well. And a layer of dust!!! 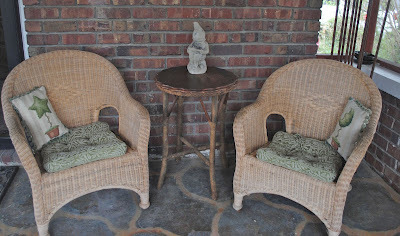 Once the porch is clean, the furniture is brought back piece by piece and it, too, is washed, and the cushions are freshened. The table even gets a nice new tablecloth! The bamboo chairs and the table with it's new clean tablecloth. Ready for afternoon tea with a friend. A clean porch, after all, deserves a celebration! And since it's spring . . . 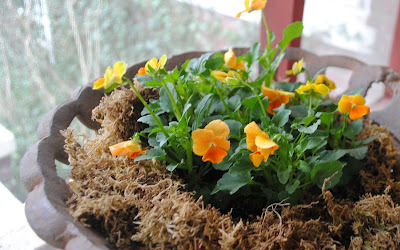 The iron pot is filed with violas. Fresh plants definitely brighten the porch and soon, some inside plants, will make the front porch a green space! 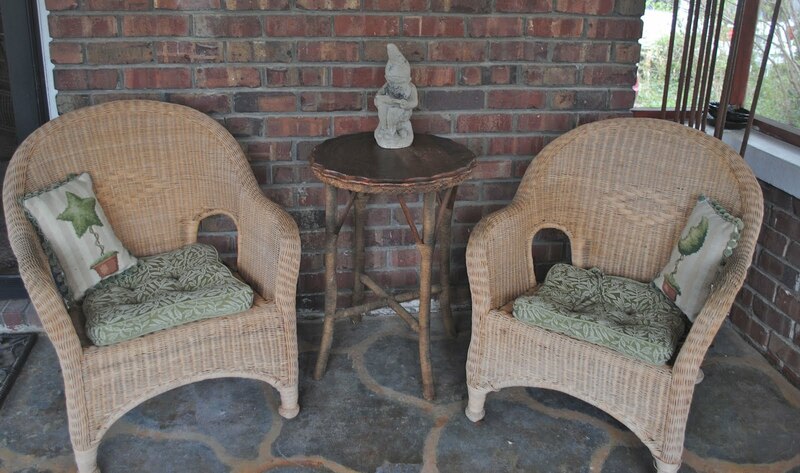 The two wicker chairs and a wicker table. 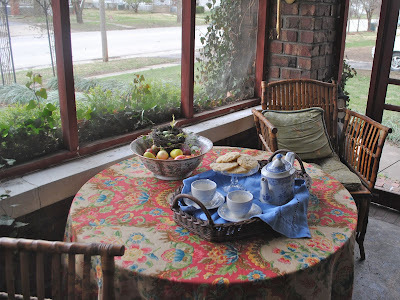 A great place to enjoy a glass of tea on a spring or summer day. 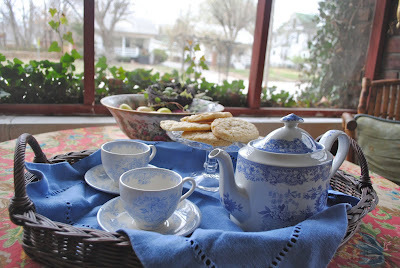 I invited friend Sally to come and have tea with me on the porch -- a clean porch should be celebrated!!! A wicker tray holds the teapot, two teacups (for we both take tea black -- no need to bring out cream and sugar) and a plate of grandmother's tea cakes. 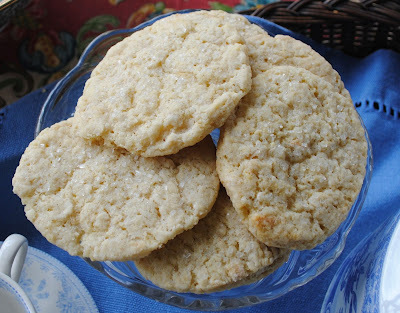 Which are wonderful soft sugar type cookies. My grandmother always had them whenever we visited and I can't eat them and not think of her. A perfect way to celebrate the Annual Spring Ritual of The Cleaning of the Porch!!! In a large bowl, sift flour, baking soda and baking powder together. Add remaining ingredients and blend well. Dough should be soft. Roll dough out onto a floured surface until approximately 1/4 inch thick. Cut dough with glass or round cookie cutter (grandmother always used a glass -- one of those green "oatmeal" ones) and bake on a slightly greased baking sheet for 10 to 12 minutes. NOTE: It is important that they be 1/4 inch thick when rolled out so that the inside is "cakey" -- they are, after all, tea cakes! what a nice afternoon, accomplishing something, visiting with a friend and thinking of your grandmother. You definetely are ready for spring! Your porch is so inviting. I love the iron pot. Do you just sit a potted plant into the iron stand? It would be good to have for smaller pots in our gusty winds. I checked out the Hawes watering cans you suggested. I'm contemplating them as I see one that looks just like what I want! What a delightful spot to have tea and cookies..
After all that hard work to get your porch sparkling clean, you deserve to celebrate with a tea party!! your porch looks so inviting. Spring has not come to NH yet and we do the same kind of cleaning. I can not wait to sit on the porch. Your porch looks so fresh and clean, cozy and friendly all ready for guests. It is worth the effort. Cookies look yummy! What a nice place to relax and even better with a friend. I love the violas. Lovely front porch and I agree the ritual deserves a celebration! Seems you've been a few steps ahead of me with Spring cleaning, again. Yesterday, (still in the upper 30's here on the prairie) I felt the urge to clean the deck and arrange the outdoor baker's rack. I'm saving that chore for the weekend...to be in the upper 60's, maybe the 70's! Thank you for the inspiration. Perhaps today I could bake some cookies and begin a new ritual ...borrowing one from Linderhof and my blog friend, Martha? 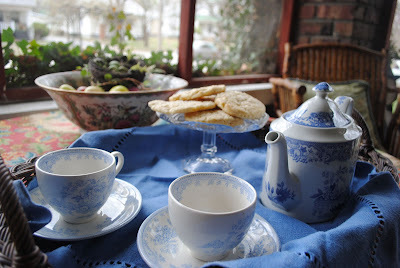 I love the feeling of a major task completed and a tea with a special friend is definitely a celebration. I still need to clean my porch but was waiting until some of the pollen subsided. Everything here is covered in yellow. I must do it before the weekend because my oldest is turning 40 and we are having a party. 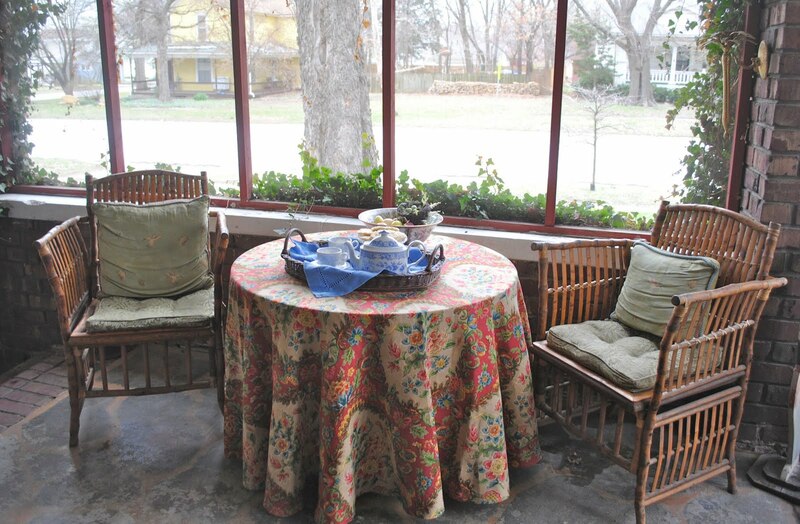 Will be seating some on the screened porch for a dinner. Nothing like an event to get things done. BTW, LOVE the iron planter. I do the same thing every spring - everything off the veranda and all is given a sweep and a wash. When everything is back in place I feel so accomplished! I'll have to try your grandmother's tea cakes - they look perfect for afternoon tea. I would love for my porch to be screened in, no pesky bugs. I like this post.Your porch and out door furniture is awesome and beautiful.I love to relax and having a cup of tea in my patio.The experience you shared in the post about your porch is really impressive.